Make sure that your computer is connected to the range expander’s Ethernet port. To know if the device is properly connected, check the LEDs on the network adapter. NOTE: This method is applicable to WRE54G v2 and v3 only. Make sure that the LED light of the computer’s network adapter is lit or blinking. NOTE: If the network adapter’s LED is not lit, try using a different cable to further isolate the problem. For instructions on how to assign a static IP address on your wired computer, click here. After assigning a static IP address, check the computer’s connectivity to the range expander. NOTE: Make sure that the IP address range of your computer is within the range of the range expander’s IP address. For example, your range expander’s IP range is: 192.168.1. "x" and your computer’s IP address must be within 192.168.1. "x" range. A ping test can trace the communication between the computer and the range expander. To ping the range expander, you will need to obtain the IP address of the range expander. The default IP address of the range expander is 192.168.1.240. To learn about ping test, click here. NOTE: If you’re still experiencing difficulty accessing the web-based setup page, reset the range expander. Press the Reset button of the range expander for 10 seconds. Doing this will restore the device to its factory settings. You would need to reconfigure the range expander after resetting. NOTE: If all the steps above failed, try to disable any security software on your computer before accessing the range expander’s web-based setup page. Click here to learn how to disable your computer’s firewall. 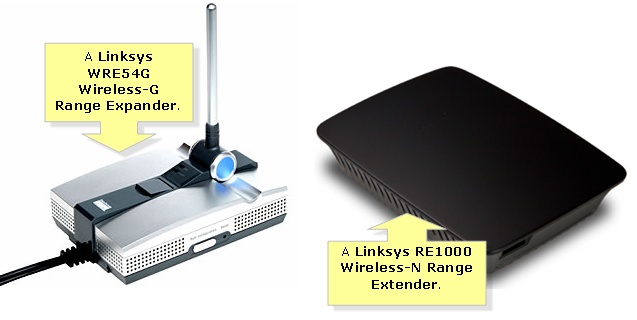 Linksys Range Extenders and Expanders are available for you to widen the range of your home network. These devices will enable you to connect computers, smart phones or tablets and other wireless home appliances to the network or the Internet. The Linksys Range Expanders and Range Extenders both expand or extend the transmission rate of a router or access point to cover the hard-to-reach areas of your house but reduces the signal rate by half. The difference between an Expander and an Extender is the technology behind it. The former is a device that is compatible with wireless-G 54 Mbps (approx.) speeds, while the latter is a wireless-N compatible device of that can service routers that run for up to 270 Mbps.